It’s been just over a year since Google updated its algorithm with Hummingbird, making it better equipped to serve conversational search queries. The day is coming when the majority of searches will be conducted with natural language; most queries will be long-tail; and optimizing for a set of short keyword phrases won’t be sufficient. Some have been saying this same thing for a long time now. But have we all been listening? New technology released by Apple in October is bringing us another step closer to device agnostic user experience. For search marketers, this is yet another reason to optimize for concepts over keywords. Here I’ll describe that technology, and also share some recent stats on voice search to help us shift our thinking toward entity SEO, optimization geared for semantic search. With the release of new operating systems for Macs and its i-devices (iPads and iPhones), Apple has created a seamless experience for Internet use (texts, emails and phone calls) with a feature-set called Continuity. One feature, Handoff, allows you to start and stop a task on one device, be it iPad, iPhone, or Mac computer, and then restart on another Apple device. Start typing an email on your phone then realize it would be easier to add attachments from your laptop? Handoff lets your laptop pick up right where your phone left off, provided both devices are near each other and on the same network. In the email example I used, when you look at your laptop you’ll see an icon representing the email you were just writing on your phone; clicking on it brings up the email right where you left off. Through Continuity, you can take phone calls on your laptop, or send and receive text messages from your laptop. Plus, all of the text messages on your iPhone appear on your laptop. So you can click on a phone number pretty much anywhere on your Mac and send an SMS or iMessage. More than half of the teens surveyed use voice search daily. Prediction 1: Device tracking becomes obsolete. I expect we’ll be moving away from a distinction between mobile vs. desktop search as new technologies gray the line; new technologies like phablets and wearables occupy a confusing middle ground. Sure, analytics can track what types of devices are visiting pages, and we as an industry can parse apart how users are accessing our websites. But Apple’s Continuity moves user behavior towards the device agnostic, which will naturally affect how people search. Entity SEO emerges. Optimize for complete coverage of concepts, sometimes called entities, over keywords. It’s already been well established that someone performing a voice search on their phone tends to use conversational language, and focuses less on keywords. 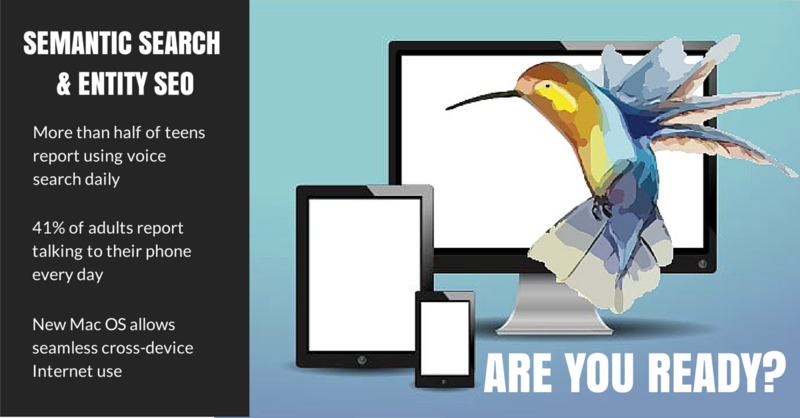 Semantic search, natural-language queries, and the underlying need to understand the connection between online concepts is exactly the basis of Google’s big Hummingbird Update last year. More than ever, understand your audience. In the midst of optimizing Meta tags, checking page load times, and monitoring backlinks, don’t forget good market research, developing well-informed user personas, and maybe run a survey. Answer questions, don’t rank for queries. In “Google Hummingbird & The Keyword” published last November, Jim Yu explains that previously SEO sought to answer the question “How do I rank for this query?” SEO today must solve the problem, “How do I best answer the questions my users have?” He says that if you’ve been staying up to date with trends in SEO, Hummingbird only reinforced the work you’d been doing. Of course, that’s a pretty big if. And I think that a lot of SEOs fall outside that if, as do a lot of site owners. The transition from keywords to concepts is happening, and this latest move from Apple is the next clarion call that mobile is taking over. More than ever, it’s time to optimize for concepts rather than keywords. A unified user experience between desktop, laptop, tablet, and phone is the latest advance with major potential to shift how people interact with their gadgets, and ultimately, how they search. I’m sorry to hear about your recent penalty, but I’m glad that these insights helped you make some sense of things. We also recently published an article (part of an 18-part tutorial) called “Avoiding Google Penalties.”. Take a look at that article for even more information on the types of penalties and how to prevent being hit. And thanks for reading! Thanks Johns… I recently got penalized by Google but don’t know the reason for penalty.. My traffic drops by 40% and rank also drops.. I have approached many SEO masters. and Now I am finding something good for being out of penalties. At the end of the day, it’s all about education; educating yourself — as well as your clients — about industry changes and why strategy priority shifts are essential. That may be one of the best recommendations I have read to date. “How do I best answer the questions my users have” is critical at this point — now trying to explain that to clients who only care about ranking that keyword is a whole different ballgame! Thank you for sharing this! Good predictions right there, John. Indeed, we are shifting into two major changes in SEO: a user- AND concept-centered one. I don’t think keywords would be completely obsolete though. Rather, we simply need to make content more relevant, useful, and engaging. Emphasis on ‘useful’, with the keywords just filling in for the technical aspect. After all, true SEO effects are those that go beyond online data. Thank you for a wonderful post. Thanks for your input, Matt. Is there a particular prediction you see as being “a ways off”? Studies are already showing that search behavior is changing; as SEOs, we need to make sure we’re keeping current with those changes. Good news about Hummingbird tech. Regards from İstanbul. Thank you for the update on Hummingbird and other SEO techniques.